Liczba stron: 68 Jest to ujednolicona liczba stron, która ułatwi Ci porównanie długości książek. Każda strona Legimi to 200 słów. 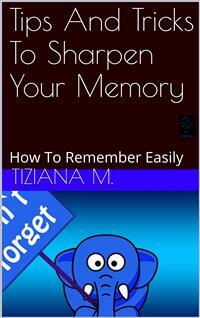 Opis ebooka Tips And Tricks To Sharpen Your Memory - Tiziana M.
A good memory is truly important for anyone to possess. Your memory of faces, names, facts, information, dates, events, circumstances and other things concerning your everyday life is the measure of your ability to prevail in today’s fast-paced, information-dependent society. With a good memory, you don’t have to fear forgetting/misplacing important stuffs and you can overcome mental barriers that hinder you from achieving success in your career, love life, and personal life.Your memory is composed of complicated neural connections in your brain which are believed to be capable of holding millions of data. The ability of your mind to retain past experiences in a highly organized manner gives you the potential to learn and create different ideas. Your experiences are the stepping stones to greater accomplishments and at the same time your guides and protectors from danger. If your memory serves you well in this respect, you are saved the agony of repeating the mistakes of the past. By remembering crucial lessons and circumstances, you avoid the mistakes and failures made by other people.Unless you have an illness or handicap, a poor memory is often attributed to lack of attention or concentration, insufficient listening skills, and other inherent bad habits; however, it can be honed and developed using the right methods. Opinie o ebooku Tips And Tricks To Sharpen Your Memory - Tiziana M.
Fragment ebooka Tips And Tricks To Sharpen Your Memory - Tiziana M.
bad habits; however, it can be honed and developed using the right methods. instructors they relate to, and careers they select. combination in our brain. There are three types of memory. Sensory Memory is where temporary information is briefly recorded. by another sensory memory unless you do something to retain it. doubtful you’ll be able to recall and apply all the methods being taught. it would be helpful if you consider points and ideas in improving your memory. This would make your retention practices more efficient and sharper. known as primacy (words at the beginning) and recency (words at the end). (for example, the word “ruby” will stand out from a list of vegetables). recency can be quite considerable. lifestyle, your attitude, your diet, and your habits. implies, they’re supplements, and not replacements.